On first glance at Nic Joly's artwork you'll likely be struck by the bold humour or strong statement. Then, you won't help but admire the skill and patience it must take to work on such a small scale, and wonder, just how does he do it? Nic's work features sculptures made from wire, paper and clay to create art that looks at the mundane, yet fascinating aspects of everyday life. In the video above you can see the love and dedication that goes behind Nic Joly's miniature sculptures. And in his latest work you can see the love most literally. His latest work, The Art Of Making Love, makes Love the subject, with the lettering of the word encased in frame. Each of the letters in The Art Of Making Love features miniatures adding to the canvas in some form. It's another playful work by Joly, and with the the bold colours on the lettering, the 3D wall sculpture stands out even more, making it a focal point in any room. “We all create a picture in our lives where we are both the artist and the focus. I have long believed that the only way for us to evolve personally and collectively is to spread kindness and love in the world around us," says Joly. "We must all act together to paint the picture of the world we want to live in." The work is available in one, limited edition piece with all lettering incased on one frame. But especially exciting with The Art Of Making Love, Nic has created 25 handmade Boutique Studio Editions. 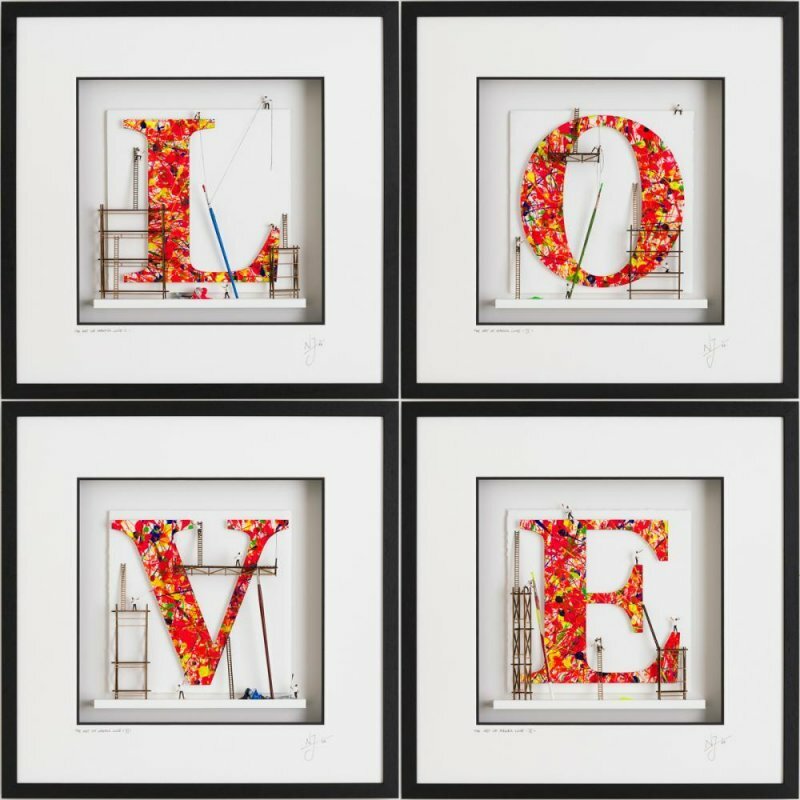 A collection of four sculptures, each letter is individually framed, meaning there are creative placement options. "With the handmade boutique edition, I have really been able to push this idea into a large-scale piece of work,” says Joly. It's one of the his finest works to date, and is sure to be highly collectable given Joly's popularity. You can see the true love in Nic Joly's craft that's for sure.